A unit study in teen entrepreneurship will equip young aspiring entrepreneurs with the knowledge, skills, and experiences to lay the foundation for a successful professional life. In this elective course, students can even plan their own teen-based business. I firmly believe teaching kids about money, entrepreneurism and business is beneficial. I also believe they should try for themselves. I have helped my oldest son Miguel the most in this area since his 8th grade year. Here is my list of best methods to teach teens about entrepreneurism and business. I have had very good experiences using The Great Courses. My daughter loved the Human Anatomy series I gave her during her Allied Health class for high school. These are very thorough although very boring (they are university lectures after all). I let him pick which ones interested him. I hate for my kids to be bored. The game Cash Flow is very good but very long, and there are lots of rules. My family played this for several evenings. It is the game that Robert Kiyosaki made to reinforce what he teaches in his books. I will advise anyone reading his books that teens should only read the ones I listed above and show in the picture. My son could not put these down. 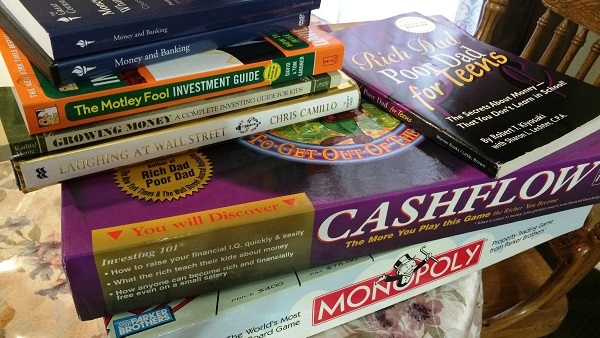 He read all 3 Kiyosaki books cover to cover – he was that interested! These were some of Kiyosaki’s first books and absolutely great for teaching kids business and money skills. It’s these that brought him fame and are pretty politically neutral. All the other books he has written start treading into VERY controversial political waters. I strongly advise any other of his books to be read by parents first. Of course Monopoly is an all time favorite. Take them to get an ID. Take them to start a bank account (or two). Take them to a financial advisor. Have them write down questions. Have them ask their own questions. Have them make a few phone calls (not all) but it is important for them to overcome their phone shyness. Have them follow their favorite businesses and brands (there are lots of apps these days for that). Have them read and watch anything related to kids and business. Have them brainstorm in notebooks. And last but not least have them participate in any contests or challenges that fit their business. For example there were a few young men who invented something to help their family farm better (farming vertical using computer boards to time the watering systems or something like that). Angelica Laurio is a homeschool parent living in Onslow County North Carolina. She has two boys (12 & 15 years old) that she’s been homeschooling for three years, enjoying the adventure of having young men to teach. She previously homeschooled her daughter (now 21 and graduated college) from 7th-12th grade.